Big-game hunters once trekked to Africa on safari in pursuit of dangerous, hard-to-hunt game animals that became known as The Big Five: lions, elephants, buffalos, rhinoceroses, and leopards. These five animals were grouped together because they were among the most difficult animals to hunt on foot. However, with increasing emphasis on conservation, tourists (like us) are now fortunate to “capture them” by shooting The Big Five on photo safaris. During our recent trip to Kenya and Tanzania with Micato Safaris, we were able to see The Big Five up close. It is estimated that some 250 to 300 lions live in the Masai Mara National Reserve in southwestern Kenya, one of the highest densities of the species found anywhere in Africa. Lions feed on zebra, buffalo and antelope and spend up to 20 hours a day at rest. While they are well camouflaged in the tall grasses, we saw more than one pride with their cubs. The elephant is my favorite of The Big Five. Because my vision isn’t the greatest, they are the easiest to spot since some of them tower more than 10 feet tall with ample girth as well. You know they have been around when you see lopped off trees they’ve uprooted. This baby was part of a herd we spotted. His ears are flapped open to cool him. Sadly, park rangers need to be vigilant to spot poachers who kill them for their valuable tusks, which can fetch great sums on the open market. Because of their size and strength, the great white hunters considered the buffalo their most dangerous and formidable foe. It was common to spot them in large herds. They are vegetarians who graze for their food but are known to kill humans when they feel threatened. We spotted this one with the cutest little hitchhiker on his back. Because they are nearly extinct (considered critically endangered), we were only able to spot a group of rhinoceroses in a small plane. Fortunately, our Micato guide took us to an animal orphanage where we could see this one up close. Because of its size, it has no natural predators but it is often chased away by elephants. They are also vegetarians. Leopards like this one often spend their days resting in a treetop. We didn’t wait long enough, but they are said to suddenly pounce on their prey, which can include baboons as well as birds and insects. Leopards are most active at night. Like domestic cats, they are excellent groomers, keeping themselves immaculately clean. N.B. Our trained Micato guides were wonderful in providing information about the Big Five and patiently helping us spot them. After we returned home, the just published DK Eyewitness Travel Guide: Kenya was an excellent resource to learn additional information about these animals, their breeding, and habitats. *This post is part of a blog hop sponsored by Liz at Travel Writer Rants and Raves. How amazing that you got to see all of these! Yes, it was a pretty amazing journey. More article and photos to come, no doubt! How thrilling! Your adventures are making me want to go. I can’t imagine seeing these fabulous animals up close and in person. What an amazing experience. The most amazing thing, which isn’t captured by the photos, is that all the animals co-mingle—unlike the way we are used to seeing them in zoos. Thanks for sharing! If I ever have the opportunity and means for a safari I know I will jump on it. I’m not too interested in travelling anymore – so much to see and appreciate here in the good ole US – yet Africa and Tuscany still call to me. You rekindled my desire. 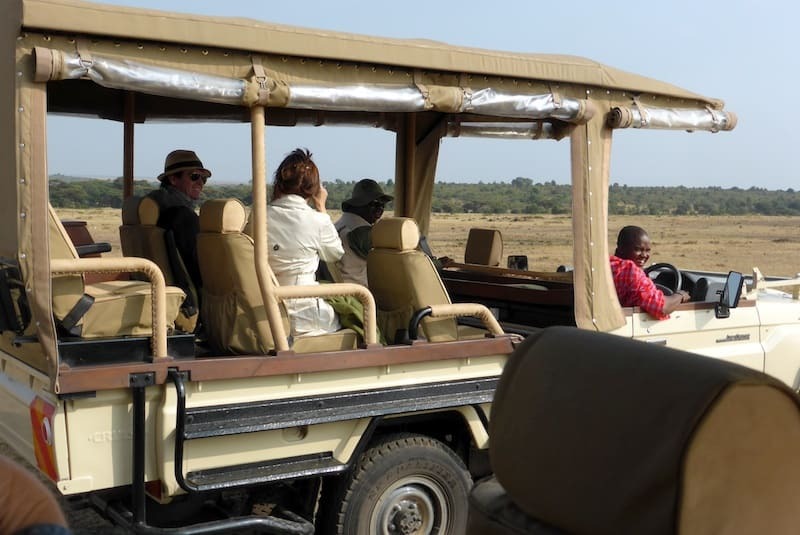 Ahhh… Reliving our recent African safari through your photos… (Our trip, which we’re now writing up: http://www.sandinmysuitcase.com/dreaming-of-our-african-safari/) Sounds like you had a fab time! I can’t imagine facing any of those guys on foot–but PARTICULARLY the Cape Buffalo. Awesome! And how lovely to get to see and photograph them. Thanks for sharing such great pictures. Sounds like an amazing trip. I would never go on a safari. I realize it is not dangerous, but I prefer to stay closer to a bathroom and civilization. We have some amazing photos my grandfather took in India, not Africa, in 1900 or so, of a safari he went on escorting a Grand Duke. Beautiful photos! What a great trip. How incredibly fun! I’ve never been a big fan of hunting, so a photo safari is right up my alley, and how lucky that you got to spot them all! Sounds like a really incredible trip! The baby elephant sent flutters to my heart. What an amazing journey! It was totally amazing to be so up close to the animals! Great photos, Irene. I feel like that leopard is looking right at me! Could that baby elephant be any cuter? Very sad that they are sought and killed by poachers. I am sure this is on everyone’s bucket list! I love South Africa for safari yet there is so much more to this country. These pictures were taken in Kenya and Tanzania. I hope to get to South Africa one day, Gaelyn. Thanks for visiting!